Chunky Pizza Sauce with Fresh Basil and Extra Virgin Olive Oil is a prepared pizza sauce made from chunky tomatoes and puree. Other ingredients include extra virgin olive oil, fresh basil and salt. It is prepared from round and or pear tomatoes that have been washed and hand sorted for quality before peeling and chopped. The product is hot filled to ensure commercial sterility then cooled before stacking. 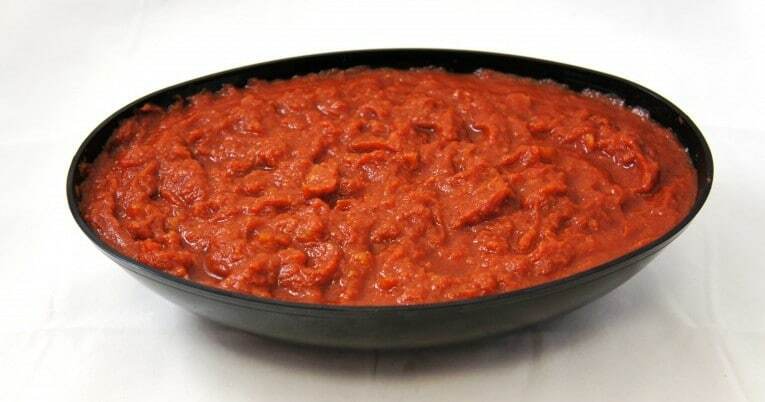 This product has a coarse finish, contains chunks of peeled tomatoes and is free from defects. Made from fresh California, vine ripened tomatoes, with extra virgin olive oil and fresh basil. Superior quality, extra sweet prepared pizza sauce. Ready to use, saves on labor.